The Museum of Fundació Antoni Tapies Foundation is located in the old publishing house Simon i Montaner in the district of Eixample. The Fundació Antoni Tapies was founded in 1984 by the artist Tàpies himelf, to make room for the modern and classical art. In 1990 then the museum moved in the 1885 building. The building was designed by one of the most important architects of Modernism Lluis Domènech i Montaner for the publishing house Editorial i Muntaner Simón. The red brick house is far from easy to see. It is a sculpture of Tàpies which crownes the house, the chair and Cloud "(Nuvil i Cadira). From afar it looks a little like a barbed wire mesh. Since the death of Miró, Antoni Tàpies was the most important artists of Barcelona, also known far beyond the borders of Spain. The Museum of the Fundació Antoni Tàpies devoted to the works of Catalan artist Antoni Tapies, who was born in 1923. 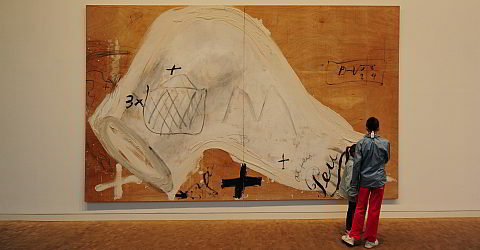 The exhibition opened in 1990 and is considered the leading exhibition of the works of Tàpies. The Fundació Antoni Tàpies has the most complete collection of works by the Catalan artist. In addition to his works the Fundació Antoni Tapies dedicated to changing exhibitions in various other artists. With the Barcelona Card you have reduced admission to the museum. Closed on 25/26 Dec., 1 and 6 Jan.
Free admission with the Barcelona Card (Skip the line).